The law offices of Michael P. Lynch are located at 117 High Street, Westerly Rhode Island, and 1140 Reservoir Avenue, Cranston Rhode Island. 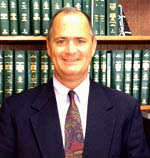 Attorney Lynch has been practicing law since 1986. After obtaining his B.S. in Business Administration from Providence College in 1983, Attorney Lynch continued his education at Gonzaga University School of Law in Spokane Washington, and then The Columbus School of Law at The Catholic University of America in Washington D.C. in 1986. Click on any of the services listed below to learn how Lynch Law Offices can assist you with your legal needs.